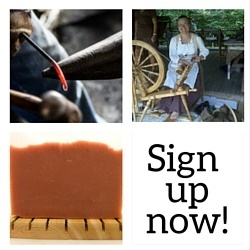 Learn the art of soap making in our soap making classes held on our working Tennessee farm, conveniently located just 45 minutes west of Nashville, TN. Our beginning soap making class is our most popular and is hands on, with students making their very own batch of soap to take home and keep along with a silicon sold mold. Each beginning class is three hours long and the $60 class fee includes all materials and a 1 lb. silicon soap mold. We limit class sizes to five students or less in all of our classes to ensure you get plenty of hands-on instruction and help, with plenty of time for questions — and even time for a quick break to go visit with our peacocks, goats, sheep, and donkeys! Many beginning students go on to take our intermediate and advanced classes, which are similar in cost and small class size with plenty of hands-on learning, Please click through any of the class links below for more details and to sign up and pay online. Our Beginning Soap Making class is perfect for beginners and covers all aspects of soap making. Unlike some demo-only classes, each student gets hands-on experience and will make their own personalized batch of cold-process soap in a 1 lb. soap mold that is yours to take home and keep. We cover all aspects of the soap making process in the Intro class — including safely working with lye — and students get a 20+ page PDF guide that includes many different soap recipes and resources. We also offer our Intermediate Soap Making class for students looking to tackle some more advanced soap making projects. The Intermediate class takes the basics that students have learned and extends them to several different projects such as making goat milk soap, shaving soap, and soap via the hot-process/crockpot method. We spend some time in the Intermediate class discussing oil properties more in depth as well as diving deeper into the science/art of selecting fragrances. 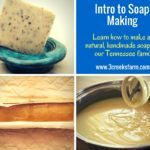 The Advanced Soap Making class extends what students have learned so far to the online world, walking them through how soap recipes are made from scratch using online soap calculators. Students make their own 5 lb. batch of soap from scratch and we explore more advanced topics such as superfatting, water discounting, and more.